Where would we be without teachers? 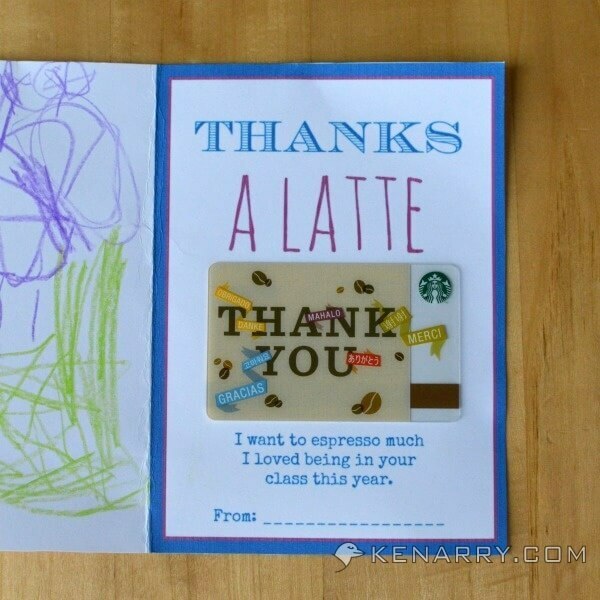 This free Printable Teacher Appreciation Card allows your child to say “thanks a latte” for all they did this school year. It is important to teach children to show appreciation. Teachers should be recognized for their hard work all year. 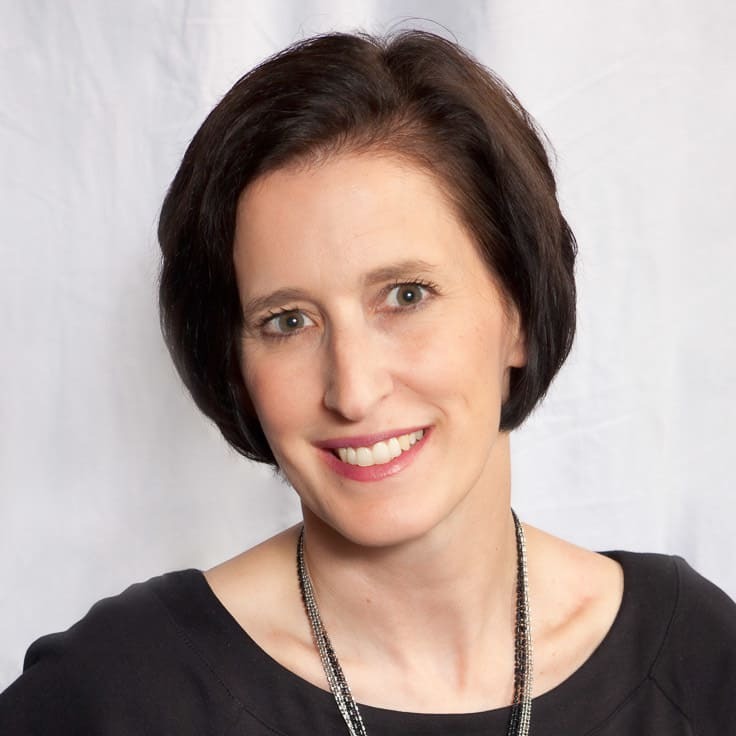 Many go above and beyond to serve their students in the classroom. The gift doesn’t need to be expensive. It’s the thought that counts. Gifts that are personalized by the student are especially valued or cherished by teachers. After gathering those great ideas and insights, we decided to create our own Printable Teacher Appreciation Card for our three year old son to color for his teachers. The thank you card includes puns about coffee, so we attached a $10 Starbucks gift card as a token of our appreciation. It was so easy to do and a big hit with our son’s 3-School teachers. 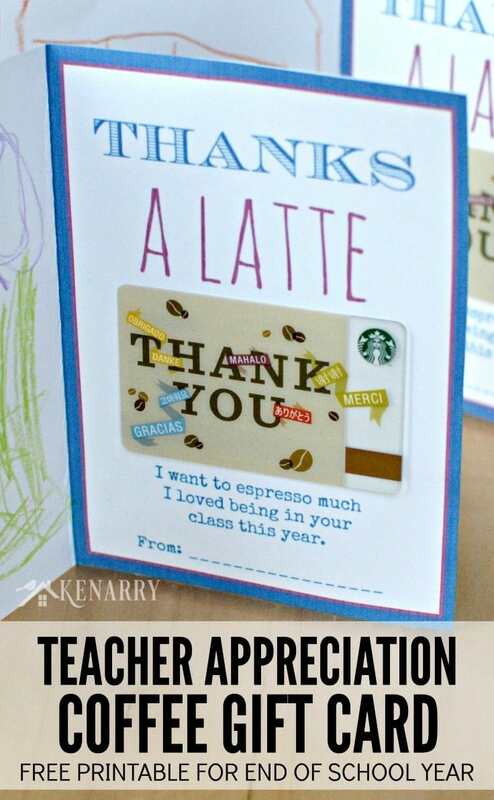 We wanted to share the Printable Teacher Appreciation Card as a FREE digital download for Kenarry Idea Insiders. 1. 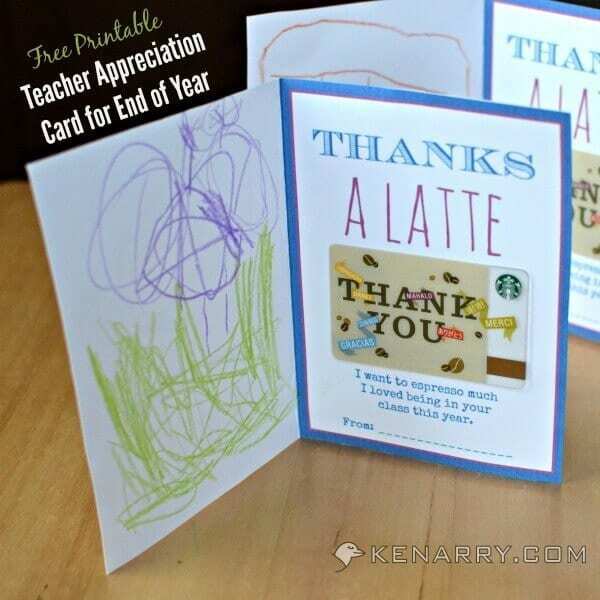 Get the free “Thanks a Latte” Teacher Appreciation Card. The printable “Thanks a Latte” Teacher Appreciation card is available as a FREE gift when you sign up below! Then you just need to download the PDF file and save it to your computer. 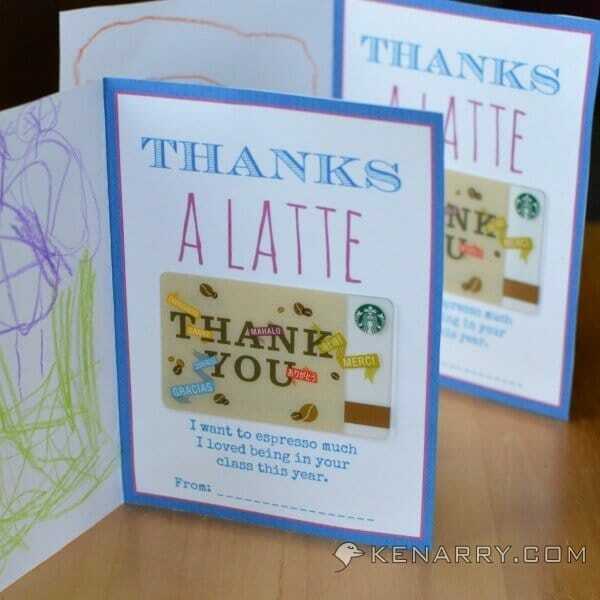 The “Thanks a Latte” Teacher Appreciation card and all other free printables from Ideas for the Home by Kenarry™ are for your own PERSONAL USE ONLY. 2. Print and Cut the Printable Teacher Appreciation Card. Print the card in color on white card stock. 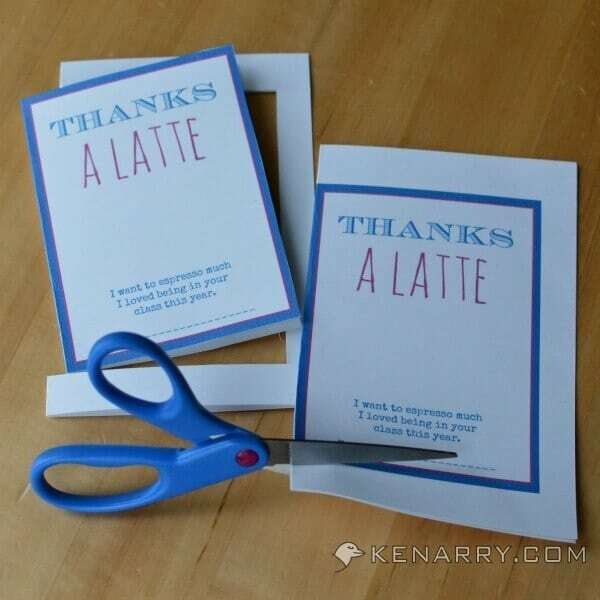 We wanted the “Thanks A Latte” message to be the inside of the card, but first we folded it backwards so we could trim the edges with scissors. 3. Have your child decorate the card. 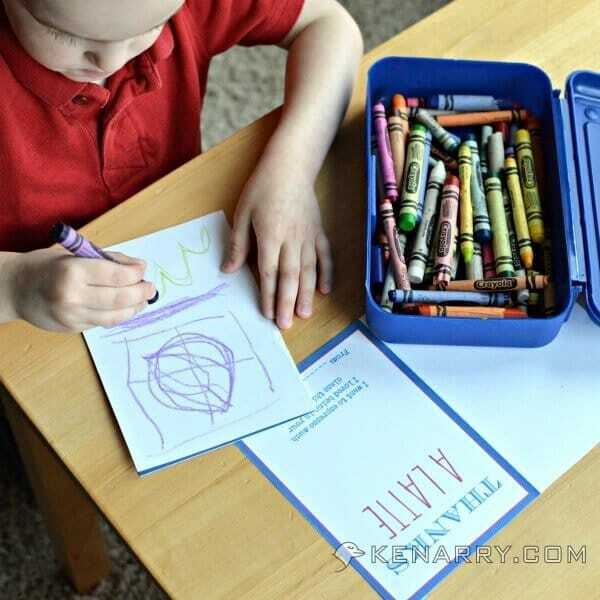 Allow your child to draw pictures and color the card anyway he (or she) wants. This is their opportunity to personalize the card and express their gratitude to their teachers. 4. Attach the gift card. 5. Sign, seal and deliver. I happened to be the parent helper in my son’s classroom the day he delivered the cards to his teachers. I loved seeing him walk up to each teacher individually to verbally thank her for being his teacher this year. He gave each one a hug and then proudly handed her the card he made for her himself. 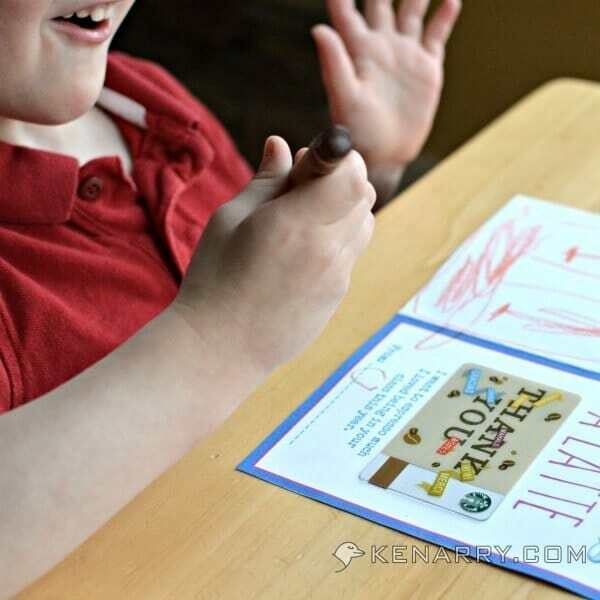 This Printable Teacher Appreciation Card is an easy inexpensive way to teach your child to show appreciation and to delight his or her teachers at the same time. What are you planning to do to thank your child’s teachers at the end of the year? Please comment below and share. Still looking for ideas? Visit our Teacher Gift Ideas Board on Pinterest. 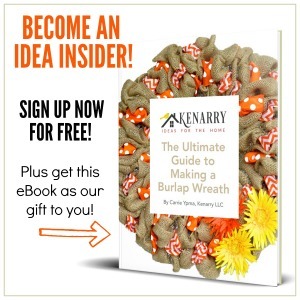 You can also see other Gift Ideas on Ideas for the Home by Kenarry™. Barb, Thanks for your kind words about the printable card we created. I can see why a personal card would be a teacher’s favorite gift from her students. I’m so glad you stopped by from “The Wednesday Round Up”! What an adorable and thoughtful idea! Thanks for linking up at the Pretty Pintastic Party! Glad you liked it, Alli. Thanks for hosting such a fun new party. I love this idea! I’m a Pinterest follower stopping by from “Friday Pin Fest”! Thanks, Melissa! I’m so glad you stopped by. What a great way to show a teacher you care. This card is so cute! My daughter’s last day at school is next week and I’d love to give her teachers a little gift for the end of the year. This is perfect! Thanks, Carrie! I hope your daughter’s teachers love the card as much as my son’s teachers did. They did! My daughter has three teachers in her classroom and they all loved it! Yay! I’m so glad they enjoyed it. Thanks for stopping back to let me know. Awww, these are great. Thank you for sharing! What a cute card. I am always looking for fun ways to thank my kids teachers. This is a keeper for sure. Thanks, Jill! I’m so glad you liked the card and hope your kids’ teachers will love it too.